ATLANTA—The supply of new hotel rooms entering the U.S. lodging markets will peak in 2018. Based on the recently released March 2018 edition of Hotel Horizons, CBRE Hotels’ Americas Research is forecasting the net addition of approximately 101,000 rooms to the U.S. lodging inventory during 2018, an increase of 2% over 2017 average annual daily supply. This is the largest number of new rooms to enter the market since the 130,000 rooms that came online in 2009. 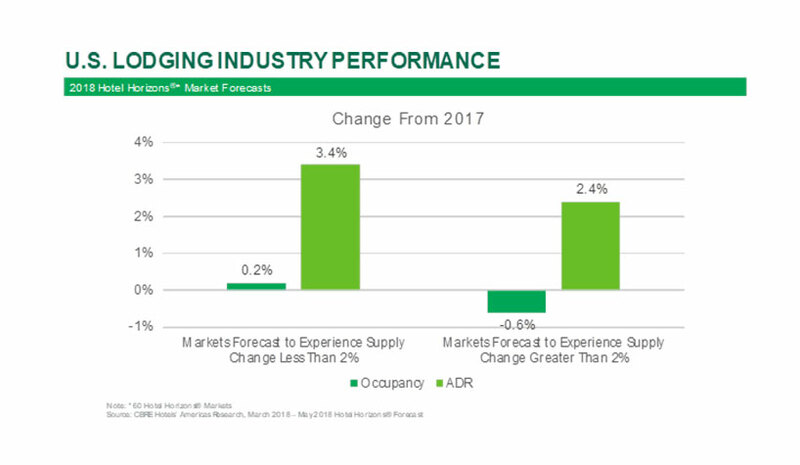 In the 42 markets forecast to experience a supply increase greater than 2%, occupancy levels are projected to decline on average by 0.6%, while the ADR is expected to increase by 2.4%. Both measures are below the average changes estimated for the remaining 18 markets. 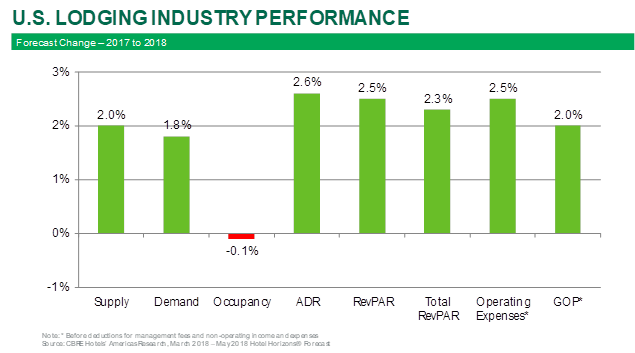 During 2018, hotels in the markets that are forecast to see a supply change of less than 2% should experience increases in both occupancy (0.2%) and ADR (3.4%). 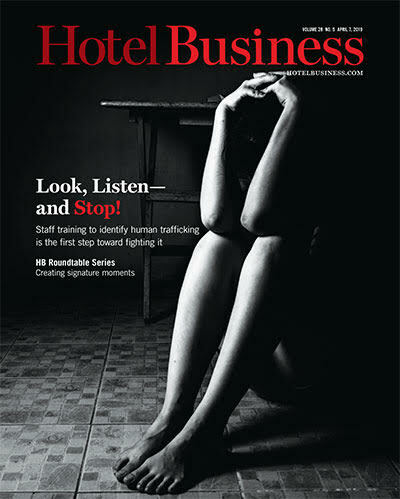 “Beyond 2018, we are expecting the pace of new hotel construction to hover around the 2% mark, but the number of net new rooms per year will taper. This is the natural progression after years of slight occupancy declines and decelerating ADR,” Woodworth said. CBRE is forecasting a national average occupancy of 65.8%, down slightly from the 65.9% achieved in 2017. National occupancy levels are forecast to remain flat in 2019 and decline in 2020. Concurrently, annual ADR change will slow down after 2018. For reference purposes, the annual demand growth rates were 1.5% in 2016 and 2.5% in 2015. The strong final three months of 2017 performance boosted the annual national occupancy rate by 0.9% to 65.9%—another record occupancy level, according to STR. With national ADR increasing by 2.1%, RevPAR growth during 2017 was 3%. ADR is forecast to increase by 2.6% in 2018, then drop to 2% in 2019 and 1.7% in 2020. “Strong national occupancy levels and decelerating changes in ADR will characterize U.S. lodging performance over the next few years. It is important to pay attention to local market conditions, especially in those areas where there will be significant gains in supply,” Woodworth concluded.